Hi everyone! I'm writing this post to introduce the jBPM Console NG project which will provide a new integrated workbench for handling process related activities. We are now in a very initial stage of development and we are looking for contributors. We know that there are a lot of companies out there implementing their own solutions and at this point we encourage you all to give us feedback about the direction that we are picking for the BPM tooling. As usual, this tooling will be integrated with all the Drools and Guvnor Tooling to provide an integrated Knowledge Development Environment. The application is being developed using Uberfire which is based on GWT (Google Web Toolkit), Errai and CDI. This mix of technologies gives us the ultimate environment to build flexible applications using a rock solid component model. I will be posting some examples showing how to get started to create new panels and add customizations to the existing code base shortly, but feel free to clone/fork the repository to take a look at the current status. The main goal behind the application is to provide an integrated environment to discover, design, deploy, execute, monitor and improve our business processes. In order to provide all this functionality we have started the development integrating our existing components inside the Uberfire infrastructure. There is an ongoing effort to integrate the jBPM Process Designer inside this platform, but I've started working on the Process Runtime Panels and in the Task Lists with the help of Maciej. The home screen shows us important information about the things that the user is enabled to do. The jBPM Lifecycle chart allows the use to select in which phase he/she wants to work. Right now I'm focused on improving the "Work" stage as it's being shown in the following screenshots. The home screen also contains a suggestion box that allows you to quickly type different "Commands" to access the different sections of the application. In order to return to the Home Screen, we can use the shortcut CTRL+H. 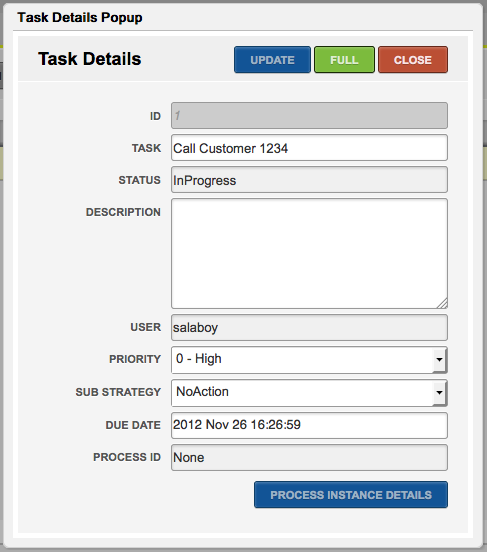 The Tasks List screen will allows us to interact with the tasks assigned to us or to the groups where we are included. As you can notice in the previous screen, my user (salaboy) was included inside the [Writer] group. This means that all the Tasks associated to the Writer group will appear in my personal task list. Notice that for each row inside the list we will have a set of actions to interact with each task. The following screenshot shows the Start button inside the Actions column, we can also edit/view the Task Details and we can also access to work on that particular task via it associated Task Form. Clicking in the Create New Task button, we will be able to create a new Task for us or for other person inside the organization. The task will be created assigned to us, but we can forward the task later. Notice that we can also create a Quick Task, this means that the task will be automatically started and can be used as a simple TODO task. No matter where we are in the application we can use the shortcut CTRL+T to create a new task. The Task Details popup allows us to see the most important information about the a particular task. If we want to access to a more detailed view about that particular task we can click the Full button which will open more panels related with that task. Notice that This task is not associated with any business processes, but for those variables which are associated with a business process instance, we can access to see the process instance details using the "Process Instance Details" button on the bottom. 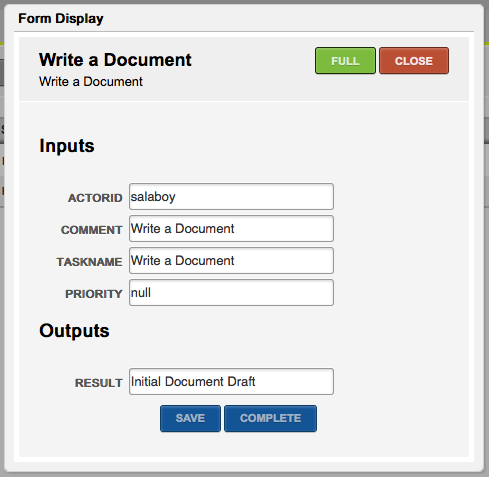 The current version allows us to interact with tasks via Task Forms which are dynamically generated based on the task content and the expected outputs. This task is already in progress, and for that reason you can see the Complete button on the bottom of the form. If the task is in a different state, different buttons will be displayed. As you can see the Save button will allow the user to store intermediate steps of the information that is being filled up inside the form. The Full button can be used to see the form with more contextual data, like for example Task Attachments or Task Comments. The Process Management panels will allows us to see all the available Process Definitions and it will allows us to create new Process Instances. As you can see in the following screenshot, you will be able to inspect the Process Definition Details to see the process diagram and relevant information about each process. Inside the Process Instance Details you will be able to see the current status of the Process Variables, the activities that are being executed and also the Log for that particular instance. From the Process Instance List you will be able to signal events. The Events List will be retrieved based on the process definition and the Signal Ref suggestion box list you all the events related with the selected Process Instance. During the following months we will be working on polishing the current panels and services behind the application to provide an error free environment that allows you to execute your business processes and interact with the Human Task Services. During this initial phase of development we are looking forward to improve the user experience, and for this reason we encourage you to try the latest source code and let us know what you think. This initial version can also be deployed in the cloud, like for example OpenShift. We believe that this will help a lot new users that want to try out an existing installation. There a lot of things that needs to be done, so take a look at the following section because if you want to get involved with the development of an open source tooling this is a very good opportunity to learn and to join the project.